I admit I am fickle. My to-do lists don't always work because I keep changing them. My to-read list is even worse. No matter what book I think I'll read next, some other volume jumps the line. 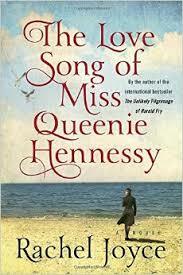 Of course, with my audiobook selections, the finds are often serendipitous, as was the case with Rachel Joyce's new novel, The Love Song of Miss Queenie Hennessy. I had read her earlier novel The Unlikely Pilgrimage of Harold Fry at the recommendation of one of my once-a-year reader friends I know through the National Council of Teachers of English convention sessions--Readers Ourselves. The novel followed the journey of a man, recently retired, as he decides almost by default to walk to the north of England to see once more Queenie Hennessy after he receives a letter from her to let him know she is in hospice and wishes to thank him for his long-ago friendship. It was a charming, wonderful story that stuck in my head. I had no idea Joyce had written another novel until I saw it on the shelf. I think she was almost as surprised to start writing it. In this story (a pattern I'm recognizing in lots of my reading lately), she tells the story from the point of view of Queenie. Most of the story is set in the Catholic hospice where she is living out her final days. When she receives a card from Harold--whom she hasn't seen in many years--telling her he is coming to see her and advising her to wait, the message has an effect on all of the patients and caregivers at the facility. In preparation for Harold's arrival, Queenie begins writing a long letter of confession, with the help of one of the nuns and her portable typewriter. Through the letters, readers learn about Queenie's life, particularly at the time of many of the events Harold recalled in the earlier book. While the book would certainly stand alone, I strongly advice anyone to read the other book first. Since I had read it at least a couple of years ago, this book felt like revisiting an old friend, having my memory pleasantly jogged along the way. The best surprise in reading the novel is that the most pleasant passages occur in the hospice facility. Joyce's characters are colorful and so well-drawn. The patients and the nuns who work there are quirky, sometimes curmudgeonly, yet lovable. As one of the women reminds the others: I may be dying but I'm not dead yet. Maybe that's the take-away from the book: there's such a beauty in the way the characters learn to make the most of the time they do have. Reading the book--these books--makes me want to take my own pilgrimage to some of the more out-of-the-way places in England too. Maybe I'd even find Queenie's sea garden. I'd love to have someone do a psychological analysis based solely on my reading list. I appreciated an observation by Dylan Thomas about his own habits: "I read indiscriminately and with my eyes hanging out." I admit that I do discriminate sometimes, simply because I have so many choices. If I start a book and can tell right away it doesn't fit the bill, I will abandon it. Life's too short, and my book stack is too high. In fact, the mere process of picking what to read next fills me with anxiety. Anything I choose means something else I postpone. One of the perks, then, of audiobooks is that they are not in direct competition with the books on my shelves. While I could read while driving (and I'll confess that I have in the past), it's inadvisable. As a result, my selection is narrowed to what I can find on the library shelves. Even though I work through the stacks of four different libraries, I'm less likely to go and find a specific book I was looking for than to discover something I just might want to read. 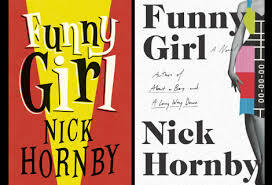 Funny Girl, Nick Hornby's latest, was just such a discovery. I had read (or listened to--honestly can't remember) Juliet Naked. I also have a couple of other novels of his on my shelves. This one, set in the sixties, follows a young woman, Barbara from Blackpool, a town in Northern England, who gives up her "Miss Blackpool" tiara within minutes of being selected, realizing she has little interest in going to ribbon cuttings at strip malls or making appearances at senior living facilities. She wants to be a comedian. She goes instead to London, where she ends up working at the cosmetics counter of a department store--just as she had back home. Following a roommate's advice, she tries to meet men who might help her gain an advantage. While the plan doesn't work out quite right, by chance she does meet Brian, the man who opens doors for her--just not the ones he intended. A self-proclaimed "happily married man"--His wife is with him when he meets Barbara--he expects to "spray her gold and put her in a bikini." Instead, she goes to an interview for a 30-minute BBC show and lands the part of her life. Hornby pulls together such a fun, quirky cast--Billy and Tony, the two script writers who met in jail; Clive, the actor who plays opposite Barbara but who gets second billing (in brackets in the title; and Dennis, the show's director who keeps his adoration of Barbara--with her new name Sophie Straw--quietly in check. Funny Girl won't end up on high school summer reading or AP Lit recommendation lists, but it's great for a summer read. Even better, it's perfect for a long drive, just enough time to fall in love with a funny girl whose dreams come true. 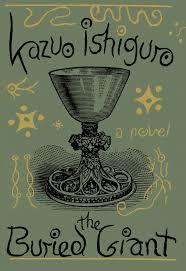 Kazuo Ishiguro manages to create something new every time he writes a novel. Remains of the Day, in its subtlety, stayed with me long, long after the last page. I remember feeling apprehensive about the movie, remembering one particularly poignant scene, just as the main character had learned that the woman he loved--without telling her--was married. He remarked that at that point, his heart had broken. That line kept echoing. How, I wondered, could anyone, even as great an actor as Anthony Hopkins, convey that emotion without words. He did. This new novel, The Buried Giant, only compares to Remains of the Day in its British setting and perhaps its subtlety. But it's not set in modern Great Britain; instead, he has placed his two main characters, Axl and Beatrice, in the time just after Arthur's day, when an uneasy, easily broken peace exists between the Britons and Saxons. As one might expect from a Medieval Romance, the story contains supernatural elements, such as Querig, a she-dragon whose breath has caused "the mists" that obscure the memory of the humans. Ishiguro even placed an aging Sir Gawain, still wearing armor and riding his old battle horse, trying to uphold the tenets of knighthood. The narrative opens as Axl and Beatrice, living in a warren-like village, deprived unjustly of a candle by their neighbors, acknowledge to one another the mysterious loss of memory affecting everyone around them. They decide to strike out on a journey to find their only son, gone a long time--although they can't exactly remember why or where. Along the way, they encounter villagers falling victim to their own fears and superstitions. As I read, I kept finding interesting parallels to my all-time favorite "journey book," Watership Down. They must avoid being caught up in the fights of others as they visit a Saxon village to find a wise medicine woman; they also realize the danger of complacency in a place they should be able to feel safe, particularly in a monastery where practices of penance leave scarred monks and bloodstained grounds. The theme that moves through the story is found in an unanswered question: Might it sometimes be better not to forget the past, at least long enough for peace to overcome bitterness? Around the time of the Charleston shootings, I read through a particularly powerful section of the narrative in which the warrior Winstan instructs his young protogee, in the event of his mentor's death, to promise to continue hating all Britons and trying to rid the world of them. Axl, meanwhile, acknowledges that the lapse of memories--even his own from a warrior past--can provide an environment ripe for forgiveness and peace. How ironic that our nation continues to be divided by our widely disparate memories, unable or unwilling to let forgiveness begin.